After successful verification download any one app from the offers. Now open menu and click Refer to earn tab. Copy your referral link and then share the link with your friend requesting them todownload the ladooo app through your referral link. 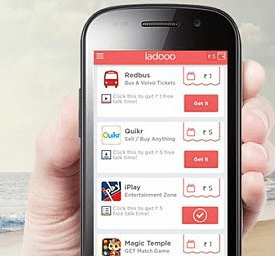 You will Earn Rs.45 when your friend clicks on the link , installs the app and signup’s at ladooo. Share it with your friends and tell them to download apps to earn free mobile recharge. When your friends downloads Ladooo from your link and try atleast one app then you will get Rs. 30 as referral amount. Ladooo is simple! Get free mobile & DTH recharge for just checking out ads. It takes less than 2 minutes to get your first free recharge. You will never have to pay for your recharges again. How can I get free talktime / recharge now? It’s pretty simple! When you do simple tasks like seeing a picture ad and answering a question about the ad or watching a video or downloading another free app, you will earn “money” in your wallet; and you can choose to redeem it as free recharge to any prepaid mobile or D2H account in India just by clicking on the wallet button (top right) on any page. This works only for prepaid mobile offered by any of the Indian telco. In other words, you can get free recharge everyday without spending money, and it really works! What do I need in order to use Ladooo? Ladooo works on any Android Device running Android version 2.3 or higher. You will also require a data or WiFi connection to use the app. How is this possible? How are you able to offer free talktime? If you are wondering how we are able to give away money like this, its very simple. We disrupt the advertising industry by giving part of the ad budgets in the form of free rewards to consumers in return for checking out ads. Does it work for my operator? We support all mobile operators in India. I am a postpaid subscriber. Does it work for me? Currently, Ladooo free recharge is for prepaid users only. However, if you have earned free money into your wallet, you can recharge any number. So start gifting free recharge to all your friends & family. NEW: You can now use Ladooo to recharge your DTH (TV) account too. Can I use this to transfer talktime to my friends and family? Yes, absolutely! All you need is their mobile number. Can I use this to recharge DTH for my friends and family? Yes, absolutely! All you need is their subscriber number. Are there any restrictions to earning free recharge? Can I also use this to get free data packs, value added services etc? Yes, absolutely! Just pick your appropriate plan from the popular top-up options. I have ported my number to another operator. Does it still work? Yes, it still works. Select the correct operator name and circle name. Can I use the money I have earned to recharge my DTH or data card accounts as well? Yes, you can use it for DTH platforms. Data card accounts are not supported yet. Please check back again later. I downloaded one of your sponsor’s apps but I’m not getting my free recharge. Can you help? 1. You didn’t run the app for long enough after downloading. Did you use it for at least 30 seconds? Did you get to know the app a bit? Did you read our instructions (some apps require completing a task)? Note that when you run the app, we get a notification from the sponsor that you installed it – sometimes that could take time depending on your Internet connection or if the sponsored app has a longer due diligence process. 2. You might have already downloaded this app before. Even if you deleted the app, you can only earn free recharge if this is the first time you’ve downloaded the app before. Also note that sometimes it takes longer to get confirmation from our sponsored apps to verify your installation. If you don’t receive the money in your wallet, please check back after 30 minutes. If you still did not receive the money, please report it to us using the FEEDBACK option in the top left menu of the app. Make sure to check our Facebook and Twitter feeds for any information about system issues. The sponsor app is incompatible with my device and won’t open! How do I get my recharge? Sometimes the applications are not compatible with all devices. If the application is incompatible and will not open on your device, unfortunately you will not get free recharge, but more apps are being added all the time! As soon as we have made sure you have installed the app, the icon in your offer wall for this offer will show a clock with “waiting” message. If for some reason, the advertiser does not approve your download, it would expire & have an “X” icon. We work very hard to avoid this, but it can happen sometimes. But if this happens for all your offers, please report it to us on FEEDBACK and we will investigate the issue and help resolve it. I referred a friend, but I don’t see any free recharge. When will I get that recharge? First of all, your friend must be a brand new Ladooo user who enrolled in Ladooo for the first time using your own special referral link. Once this has happened, you should see your referral reward credited to you. If your friend already had Ladooo and he/she tried to uninstall & re-install, you will not get the reward. I’m getting a new phone or tablet, can I transfer my credits to the new device? Sorry! At this point, your free recharge is directly associated with the device you used to earn them. They cannot be transferred to a different device, though you can use it to recharge a different number. So, be sure to spend any money you’ve earned before you get rid of your older device. When will you get new sponsor applications so I can earn more recharge? We are always working hard to get new apps available for you, but it can be hard to predict exactly when they will come through. The best way to stay on top of what’s happening with Ladooo is to follow us on Facebook and Twitter. In the meanwhile, you can refer the Ladooo app to your friends and keep earning talktime even if new offers are not available. When I try to redeem recharge to a mobile number it says ‘Please contact support’. Why? If you think this is an error, please get in touch with Ladooo support through the FEEDBACK button in the top-left menu on the app. It’s taking a long time for pages to load. We highly recommend using Ladooo over 3G or WiFi. Some users may experience longer page load times while using 2G or weak/slow networks. There was a really cool app worth a lot of recharge a while ago, now it’s gone! Where did it go? Our sponsors have time-limits and frequency caps on when and how many times their ads can be shown. So you have to be quick and when you see an offer you like, just go for it! Once you collect your reward, you can always choose to spend it any time later from your wallet.